The City of Southfield Planning Department and the Master of Urban Design (m.U.D) Program at Lawrence Technological University (LTU) have won the 2012 Michigan Association of Planning Excellence Award for Outstanding Student Project. The project, Mid-Century Modern Design Guidelines, engaged graduate level interns from the m.U.D. program to inventory, preserve and enhance the City’s significant Mid-Century Modern structures – some of which are threatened by renovation and new development. The guidelines defined the style, identified significant structures, and recommended enhancements through the use of case studies. LTU students Carolina Ferrero, David Lewis and Michael Mason, Professor Constance Bodurow and Southfield Director of City Planning Terry Croad were recognized at the 2012 Planning Excellence Awards Banquet on October 17th at the Grand Traverse Resort in Acme, MI. 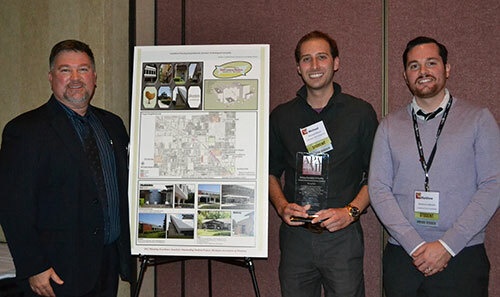 “This award recognizes the innovative work and research of these interns, in partnership with the City of Southfield’s Planning Department, who utilized local LTU resources to complete a project with limited city staff for this important analysis,” said Croad. The students gathered input from local historians, academics, and architects to identify, document, and inventory the city’s significant resources. 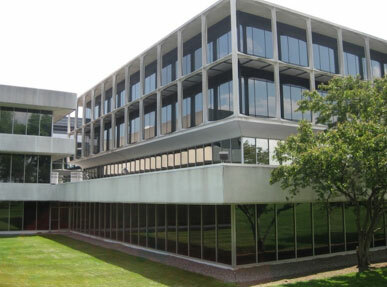 Project goals included inventory of existing resources representing the Mid-Century Modern style, recommendation of guidelines to preserve and enhance existing structures, and raised awareness and promotion of Mid-Century Modern architecture in Southfield. The project is a springboard for the creation of a walking or driving tour brochure showcasing mid-century modern structures throughout the city, as well as celebratory calendars, a website, brochures and other promotional materials. It also provides opportunity for workshops, symposiums and lectures on the subject. Additionally, owners of residential mid-century modern homes will be able to reference the guidelines for requirements on how to properly maintain, restore or build onto their historic structures.